Fans of Nintendo’s home consoles were treated to top-quality pack-in games during the 8- and 16-bit years. Super Mario Bros., Tetris, and Super Mario World are among the best games on their respective systems, and were included with the systems to add extra incentive to purchase the console. At the time of the Genesis launch, Sega was trying to clearly differentiate it’s fledgling console from the NES juggernaut by showing that it was capable of reproducing the arcade experience at home, and by marketing it to an older audience. Altered Beast was included with the console because it helped to accomplish both of those goals. The game is an arcade-style, side-scrolling action game in which the hero, a Roman centurion brought back from the grave to rescue Zeus’ kidnapped daughter, battles mutants and undead creatures whose huge detailed sprites show off the Genesis’ graphical prowess. A clear contrast exists between the dark violence of Altered Beast and the cartoony cuteness of the Super Mario series. Still, the game is extremely short and the game play repetitive and slow-paced. 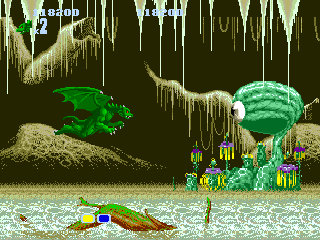 Although each level is unique in style and appearance, the game play remains the same; kill enemies with physical attacks until enough power-ups have been obtained to trigger a boss battle. The graphics are detailed and flicker-free, but the games music and sound effects sound expectedly dated compared to later Genesis releases. It is important to note though that for early adopters of the Sega Genesis, Altered Beast was likely their first exposure to 16-bit gaming, and the huge sprites, comparatively more detailed graphics, and digitized speech clearly separated it from the 8-bit pack. This game is worth the experience for its historical importance alone. Tagged Action, Altered Beast, genesis, launch, Review, sega. Bookmark the permalink.